The Rasmussen Reports daily Presidential Tracking Poll for Sunday shows Barack Obama attracting 44% of the vote while John McCain earns 42%…. The margin of sampling error—for the full sample of 3,000 Likely Voters–is +/- 2 percentage points with a 95% level of confidence. 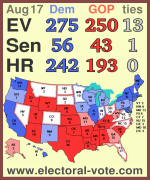 As we learned in 2000, the national popular vote is not decisive, which is why I like Electoral-Vote.com. OK, actually I like them because they have a fun widget, I have no idea whether their map is more or less accurate than other tracking maps, such as USA Today’s, which shows significantly different results for many states. But bizarrely, USA Today doesn’t bother to total the electoral votes. This entry was posted in Uncategorized and tagged 2008 Election by Kirk Petersen. Bookmark the permalink.